Allied Systems Products is celebrating over 35 years of leadership in the Times Two (X2) rotating cabinet industry! Whether your filing system is for file folders or for any type of media storage, Allied Systems Products can help design the best space saving solution. 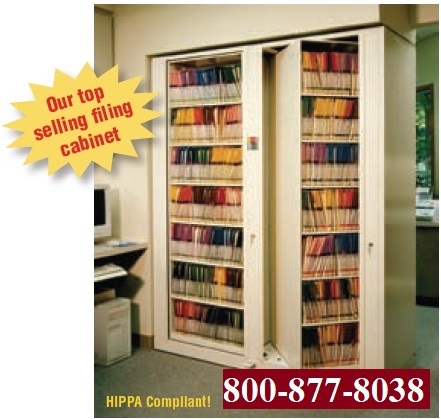 Below is a brief description about the HIPAA compliant Times Two rotating shelving cabinet. If you have further questions about the Times Two (Rotating Shelving) or any other shelving products questions, please don't hesitate to contact our friendly staff toll free at 1-800-877-8038. A double-depth, fully lockable file cabinet that rotates for access from one or both sides. Increases your filing capacity by 40-100% over single-depth storage units! Times Two Speed Files (Rotating Shelving) are flexible, space-efficient HIPAA compliant and secure. The rotating cabinet has dozens of options and accessories to store folders, computer accessories and supplies, as well as pharmaceuticals. Express shipments available, 2–5 days. 4-drawer lateral and requires less floor space. Between workstations for shared files. The new Rotating Shelving Caster Kit. This unique accessory turns Times-2/Rotating Cabinet into a mobile cabinet that's quick and easy to move for all sorts of applications including: Collaborative work areas, Hotel stations, Library work centers, Classroom rotation, School nurse’s stations. The kit installs on new X2 units or on existing units and fits Letter or Legal 2-Tier to 5-Tier sizes. With rotating file cabinet, versatility is the name of the game: so many accessories, styles, and sizes to fit a ton of storage needs for many markets. It's Your Choice. 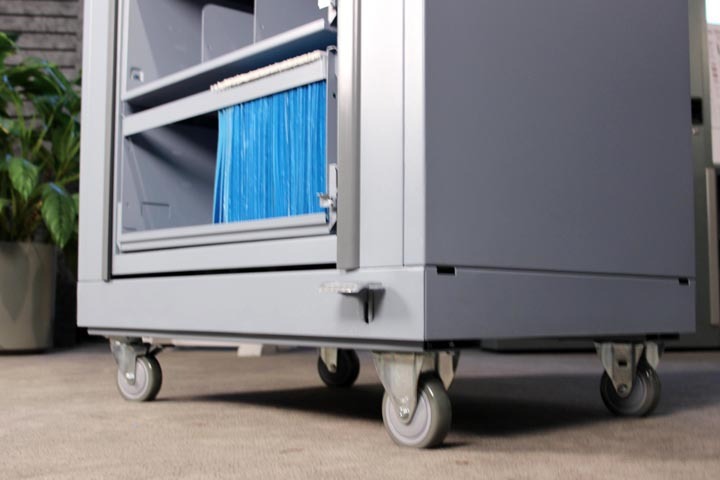 The X2 (rotating file cabinet) features a choice of two access options as standard, the Foot Pedal or Hand Release. Both provide an important built-in safety feature we call Positive Position Control. Positive Position Control ensures a controlled and positive stop every quarter turn. It prevents rotational momentum that can occur with other low cost units that are free spinning push models. A fully loaded unit without this safety feature can be unsafe. Most competitors do not offer this safety feature that is standard on there rotating file cabinet. So whether you prefer Times-2 (rotating file cabinet) with a Foot Pedal or Hand Release, you can count on the same level of safety no matter what. The foot pedal is standard. But there is a hand release optional item. Times Two rotary cabinet is the best. Times Two will handle all of your hang-ing folder requi-rements. Drawers can be stacked 1 per tier for complete hanging folder storage. Drawer front and back are slotted every 1/2 inch for adjust-ability. Drawer divider runs the full depth. Adjust-able slotted drawers allow for easy storage of CD’s, videotapes, microfilm, microfiche, index cards or checks. Our most popu-lar acce-ssory. The 5-, 6-, 7-, and 8- tier models accept the Rollout Reference Shelf with no loss of filing inches when used with standard shelves. Confi-dential docu-ments stay safe and secure. The drawer features double key lock and recessed drawer front. 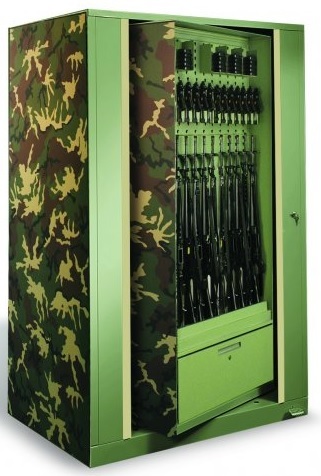 Weapons Rotating Cabinet is a dual sided flexibility and secure weapons rotating storage cabinet that can store up to 40 rifles or 198 handguns in no more than 12 square feet of floor space. The weapon rotating cabinet is modular interchangeable for all your weapons needs. Please call Allied for more information.